Chad initially contacted us a few weeks back to get a logo designed for his drug and alcohol treatment facility – Beach House Recovery. During the logo design process, he knew that a website was on his list of things to also have completed. He placed the order for the website early last week. Chad sent us the information he wanted on the website quickly and we had the website up and running within a few days. After a few modifications and the creation of the online admission form, the website was approved and ready for viewing! We appreciate the business from Chad and we hope to earn other business from him in the future. He has already left us a five star review on our Facebook page too! 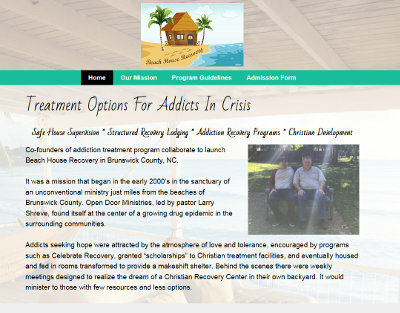 The website for Beach House Recovery is at beachhouserecovery.net. Chad reached out to us a few weeks ago and placed an order for a logo design. His organization is Beach House Recovery. Chad provided several examples and ideas of logos that he liked. However, our logo designer did have some trouble coming up with an idea that encompassed all of his requests so the work took longer than usual. After a couple of weeks, our logo designer presented one logo example to Chad that took many hours of work to complete. In the end, Chad was happy with the logo outcome and that one design provided did not need any revisions. Chad also placed a separate order for a website and we are almost finished with it, so look for our update! Nicole contacted BsnTech Networks last week for help getting a simple eCommerce website setup. She creates custom, one-of-a-kind jewelry and wanted to create her own website to sell and show her work. Nicole calls her business Round Tree Jewelry Designs. She got started with us right away and was helpful with providing us the checklists and information to complete the site. Today, everything has been finalized and she is beginning to add items to her website for sale. We appreciate the business from Nicole and look forward to helping her with any website needs in the future. Her website is at roundtreejewelry.com. Robbie, a customer that has been with BsnTech for over five years, requested that he was ready to upgrade his website. His business has grown very well over the years with customers specifically mentioning that they hired him because of his website. Robbie mostly catered to children’s parties and to the younger crowd, but he is now branching out to do shows at night clubs and help with fundraisers. Therefore, his site needed to change. He provided us an example website so we easily understood what changes he wanted and how the site should look. Within about 72 hours, we had his new website done and approved. We appreciate the continued business from Robbie! 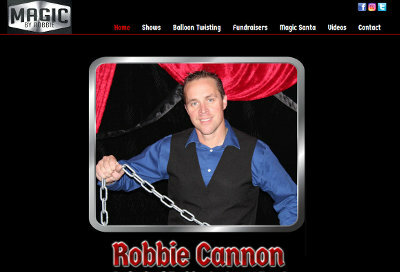 Magic by Robbie’s website is at magicbyrobbie.com.